Melody Granadillo dated Dutch murderer Joran Van der Sloot in October, 2003, just two years before he allegedly killed American teenager Natalee Holloway. And now she's coming forward to talk about her famous ex-boyfriend. Van der Sloot was catapulted to international fame after he was caught and charged with the murder of Peruvian business student Stephany Flores. It wasn't long before Van der Sloot confessed to beating and strangling the young woman in his hotel room. As more and more gruesome detail emerge, people from Joran's past are coming forward to tell their stories about the "charming" killer. The newest witness is Melody Granadillo, who dated Van der Sloot seven years ago. The two met at a party in Aruba and dated for seven months. 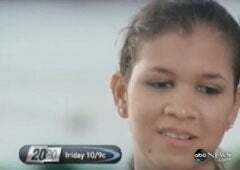 In an interview with 20/20 Granadillo says she fell in love almost immediately with the 17-year-old Van der Sloot. She says her ex was "sweet" and thoughtful. He even once made her a nice present! "I told him I liked red Skittles ... and what he did was he made this vase at school, went and bought a lot of Skittles packets, he took all the red ones out ... and as a present I got a vase full of red Skittles," Granadillo said. "He did things like that ... he was real thoughtful." Weirdly, Granadillo saved "everything" from her relationship with Van der Sloot, including a diary that described some of their first sexual encounters. She writes about one "awesome" and "romantic" night when Van der Sloot convinced her to give him a lap dance. Even though Van der Sloot cheated on her with multiple women in the short time they were together, Granadillo says she always kept in touch with him — even after Holloway's disappearance. She admits that she always knew he was a liar — "he would lie for no apparent reason at all" — but the two remained friends. She says she even spoke with Van der Sloot during his trip to Peru before he met and killed Flores. Though she once said they "liked looking into each other's eyes," she says she doesn't see him the same way anymore. "It's not connectable. You can't connect that. It's not the same person," she said. But she does have sympathy for the killer: "You see he's hurt. You see he's in trouble." After all that Van der Sloot has done, I find Granadillo's "coming forward" kind of gross. The preview promises we will learn why she is talking to the press now, but I suspect we already know why. Granadillo is riding Van der Sloot's coattails to her 15 minutes of fame. Our sustained fascination with Van der Sloot has allowed someone like Granadillo to capitalize on a teenage relationship. Though she may feign disgust at what Van der Sloot has done, she remained friends with him long after he had been accused of murder, long after he had given police false information about the location of Natalee Holloway's body. Perhaps she was blinded by the memory of her first love, but if she can't see him clearly now, she never will. He may have given her skittles and hickeys, but he ended the lives of two other young women - Granadillo should try not to forget that fact when describing her "romantic" ex.